Trying to figure out where to stay in Rome? Look no further. In this article we’re going to break down the best areas to stay in Rome, the best hotels in Rome, the best hostels in Rome and even the best apartments in Rome. This city is one of the best places to visit in Italy, so make sure you give yourself enough time when traveling to Rome to fully enjoy the city. Trying to decide where to stay in Rome can be a bit of an overwhelming task. With so many beautiful neighbourhoods, it’s hard to choose what is the perfect place for you. We’re going to list the popular areas in the city for travellers, and what they have to offer, so you don’t have to spend an eternity trying to figure out where to stay in the Eternal City! The Termini District has, by far, the most budget and mid-range accommodation options. If you’re looking for the best hostels in Rome, look no further than this area. And if you’re looking for the most affordable guesthouses and hotels, this is also where to stay in Rome. The nearby neighbourhood of Monti is considered a trendy, hip area and you’re just minutes away from there if you choose this district. Termini is also one of the more convenient places to stay in Rome. Sure, it’s about a 25 minute walk to the historical center, and a long 45 minute jaunt to the Trastevere neighbourhood, but Termini is situated right next to Rome’s most popular train station. If you’re arriving in Rome by train, you’ll arrive here. If you’re arriving at the Leonardo Da Vinci Airport, it’s one metro line on the Leonardo Express Train (€11 ($13) to arrive here at Roma Termini Station. And any time you’re walking around the city and need to head to your hotel / hostel, you can simply hop on any bus that says “Termini” and you’ll go right to the station. In terms of logistics, ease of visiting Rome’s main historic sites and transfers to the airports and inter-city trains, Termini is the best hotel district to base yourself in Rome. Not to mention, the most affordable. Admittedly, the best of Rome’s sights aren’t found around the terminal, but there are still some things worth checking out if this is where you choose to stay in Rome. Museo Nazionale Romano: A lovely Neo-Renaissance palace with a classical art collection including sculptures, mosaics & gold jewelry. The Baths of Diocletian: Having been to Split, Croatia where the Emperor Diocletian made his palace masterpiece, we love to see his style of architecture. This bath complex is very near to the Palazzo Massimo alle Terme and the Palazzo Altemps. 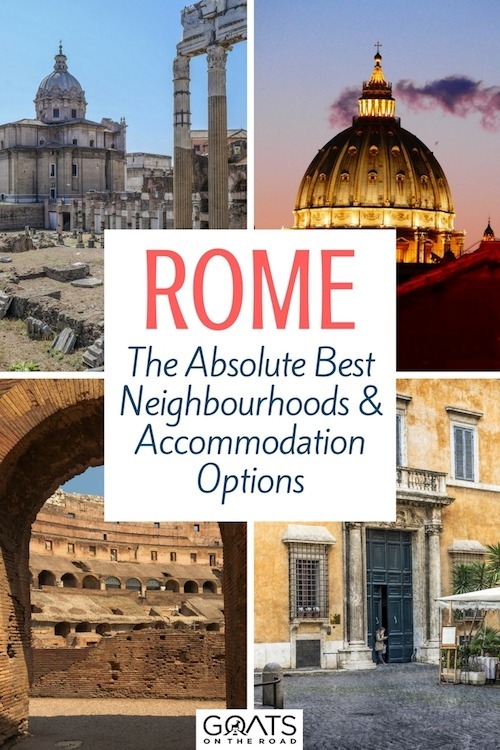 With the widest range of accommodation options and budgets, if you’re trying to figure out where to stay in Rome, we think this is a good area. There are literally dozens of hotels, hostels, guesthouses and apartments to choose from, but not all of them are worth considering. Below we’ve listed the absolute best of the best. The Beehive Hostel: In our opinion (and the opinion of many other travellers), this is the best hostel in Rome by far. Owned by a friendly American couple who have lived in Italy for 17 years, the double rooms here (and the dorms) are large and bright. There’s a cool on site cafe serving up healthy, wholesome breakfasts and drinks at a fair price, and there are some stylish “comfort zones” throughout the property for guest’s use – check out the garden, cafe and lounge. The Beehive is located just a few steps from Roma Termini on a quiet back street. The beds here are as comfortable as you’ll find in any hostel and every room is tastefully decorated. In the low season you can get a private room at the Beehive Hostel for around €60 / night, while in the high-season, their rates are still very competitive at just €80 / night for a private room with shared bathroom. The price includes wi-fi, fan, luggage storage, daily cleaning, hair dryers, safe deposit box, a free travel app for Rome, assistance with onward travel if needed, and more. If you’re wondering where to stay in Rome on a budget, this is the top pick. The best hotels in Rome vary from relatively affordable to extremely expensive. Luckily, you can get some beautiful rooms for great deals if you book on Booking.com as early as possible before checking in. We’re not going to list the ridiculously expensive rooms, because some of the best hotels and guesthouses around Roma Termini are in the low-end to midrange area. 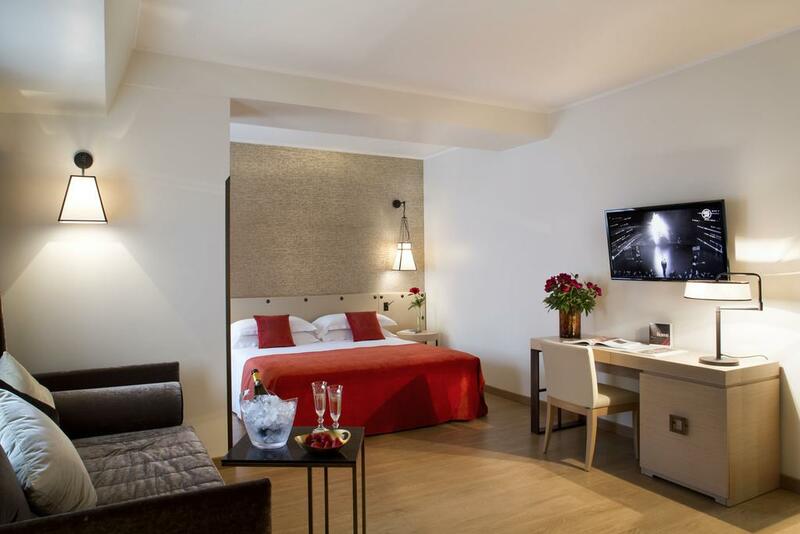 Aenea Superior Inn: This beautiful hotel occupies the first 2 floors of an elegant Roman building in the trendy Monti district. When we were in Rome in April, these rooms were available starting at €139 but prices depend on the season. Rooms offer air conditioning, satellite TV, free Wi-Fi, and a Nespresso coffee machine. The area around the Aenea is full of shopping and typical restaurants. The Colosseum and the Roman Forum are nearby, and Termini Train Station is 500 m away. Some rooms offer a view of the ancient Basilica of Santa Pudenziana. A free light breakfast is delivered to the rooms each morning. 2. Easyrome Guest House: This highly rated accommodation has just 3 comfortable rooms, so make sure you book in advance. Located just a 4 minute walk to the Termini Train Station, this property is in an ideal spot. Arriving and leaving the city is a breeze with the terminal nearby and you’ll also be able to easily access local buses. But, walking in Rome is what it’s all about and from Easyrome Guesthouse, you’re just an enjoyable 20 minute walk from the main sights. This guesthouse offers ornate rooms with private bathroom, WiFi, air-conditioning / heating, flat screen TVs and a kettle in the room. They offer luggage storage and a free breakfast at a nearby cafe. Not only does the guesthouse have all the amenities you need, but the host Enrico is amazing. He’ll help you out with anything you need, give you his secret local dining spots and is on call 24/7 for any issues that may arise. If you’re wondering where to stay in Rome near the train station, this is a good bet. 3. A Roman Tale B&B: You can’t beat the location or the value for money at this B&B! If you’re trying to decide where to stay in Rome and are looking for a medium sized room, a wonderful host and want to be close to the Termini, then look no further. The super host here will provide you with local knowledge (including his favourite restaurants!). The rooms are well decorated, and each has its own private bathroom. Rated “Exceptional” 9.5/10 on Booking.com. 4. 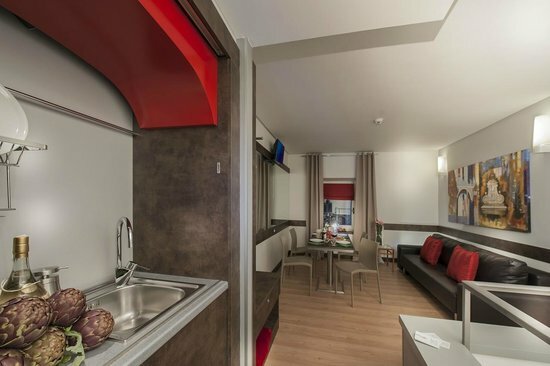 Starhotels Metropole: In Rome’s central Repubblica area, just a few minutes walk from the Opera House, Termini Station, Rome’s terminal for metro, buses and trains, The Colosseum and the Trevi Fountain. The rooms here are elegant, modern and air-conditioned, and come with a 32″ LCD satellite TV. Each room also features comfortable beds and tea/coffee-making facilities. The attached Apicio Restaurant serves both Roman cuisine and a range of international dishes, all prepared with products by Eataly. The varied breakfast served in the morning is an American-style buffet. Domus Rome Holiday Apartments: These lovely apartments are very close to Roma Termini train station and at just €100 / night, this where to stay in Rome if you want to stay a while or do some self-catering. Each apartment comes with a kitchenette, a safe, air conditioning and an LCD TV. Apartments are a great option in Rome because you can cook for yourself sometimes to save a lot of money on food. The historical center is where most of Rome’s most famous sights, historical buildings, top restaurants and places of interest will be found. 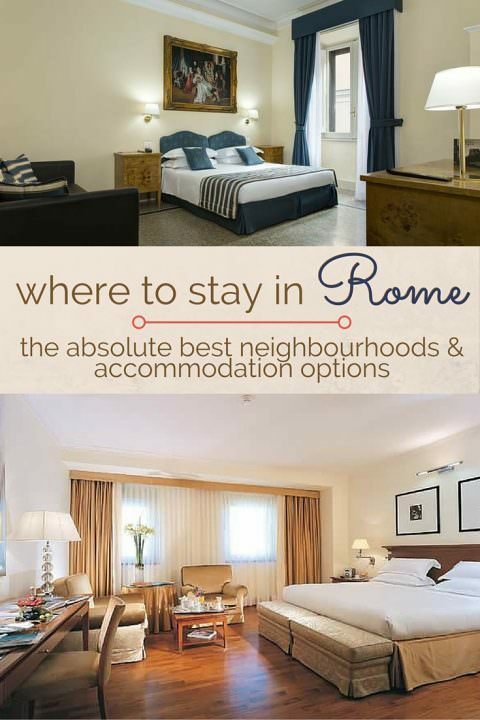 You have a lot of options for where to stay in Rome, and while the city is well-connected by public transport, you may want to stay in the Historical center to ensure that you’re always close to the action. From here, it’s an easy walk to just about everywhere in town. Trastavere is about 15 minutes by foot, over a beautiful bridge. Roma Termini is still just a 20 minute walk away, and every sight that you’ll want to see while visiting Rome is within the Historical Center. If you want to be near all of the sights, and not have to walk far to see the best of Rome, consider staying in the Historical Center, which is often the most sought-after area. There are far too many things to see around the Historical Center to list them all here, but we’ll list some of the main sights that you won’t want to miss while in Rome. The Colosseum: Rome’s grandest and most iconic sight, the Colosseum rises from the city like a stone souvenir, a testament to the memory of this once great empire. Consider taking a Colosseum tour with Walks of Italy to get a real feel for the history of this incredible structure. The Vatican City: Technically not a part of the Historical Center and actually a country all its own, the Vatican City is a definite must see on any day trip to Rome. Be warned that the line-ups can be enormous and it can take hours to get in. If you do a Vatican City Tour with Walks of Italy, you’ll skip the lines and your travel guide will help you to understand the city, its art and its architecture. Alter of The Fatherland: A blindingly white, columned structure as controversial as it is grand, this monument was built over a historical neighbourhood. The locals don’t like the fact that it ruined a beautiful part of town, but it is, none-the-less, an impressive sight to behold. Piazza Navona: Arguably Rome’s most beautiful plaza, the Piazza Navona is a great place to people watch and be entertained by street-performers. You can also stand in awe of the Sant’Agnese in Agone and the two glorious fountains. The Navona Plaza, Roman columns and the Trevi Fountain on the bottom right. Church Of Saint Augustine: This basilica has a number of beautiful artworks, but the best by far is the important Baroque painting by Caravaggio in the back right corner of the church. The Trevi Fountain: Who knew a fountain could rival the Colosseum as the most awe-inspiring sight in Rome. The intricate carvings of this 18th century masterpiece can be gawked at for an hour. With so many excellent restaurants in this area, you may just find that the best accommodation in the historic center depends on its proximity to your favourite restaurant! 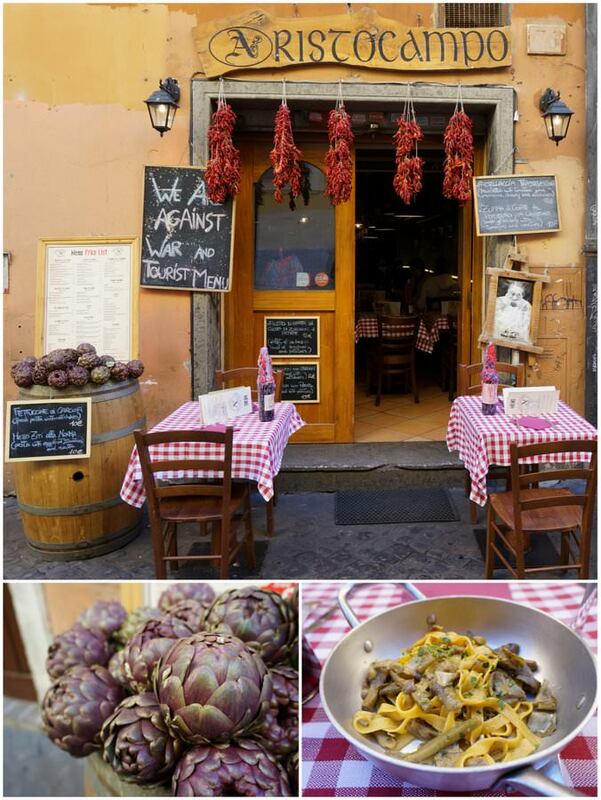 Our top pick is in one of the best parts of Rome (Navona) and it’s close to two of the city’s tastiest restaurants. When considering where to stay in Rome, maybe have a look at the nearby restaurants, cafes and bars and go from there! 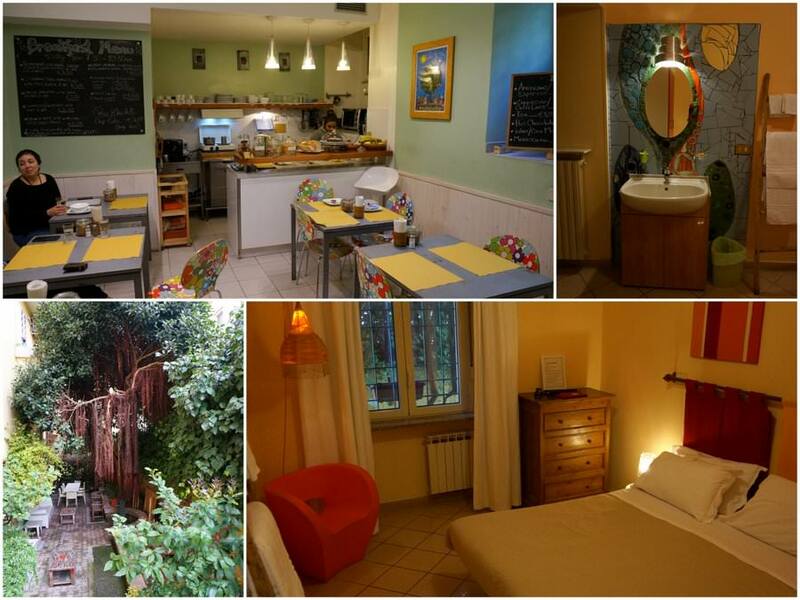 Colors Hostel: Managed by Enjoy Rome, Colors has recently opened in the city. Located just east of the Vatican, the hostel is easily accessible both by bus and from various Metro stations; and the staff are all native English-speakers. If you are looking for a hostel in Rome near the Vatican City, Vatican Museums Rome and the city center, Colors is the ideal hostel choice for you. This new Rome accommodation at Colors has a privileged location for a Rome Hostel since every major monument and tourist attraction is easily reachable via a short walk. There’s a buffet breakfast but it’s not included in the room rate. 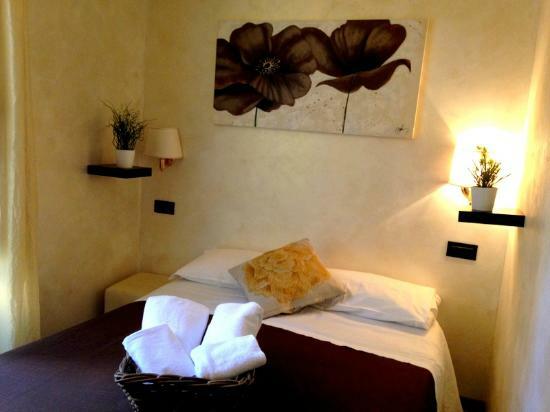 Spanish Suite Campo de Fiori: This lovely little place has a few cozy rooms and is right in the center of all of the action in Rome, in the Navona area. You really can’t beat the location of this place and the staff are very friendly and helpful as well. For the price, this is one of the best deals in Rome. The hotel is located within walking distance to the Trastevere neighbourhood, 10 minutes to the Pantheon, as well as pretty much every major sight in the historic center of Rome. 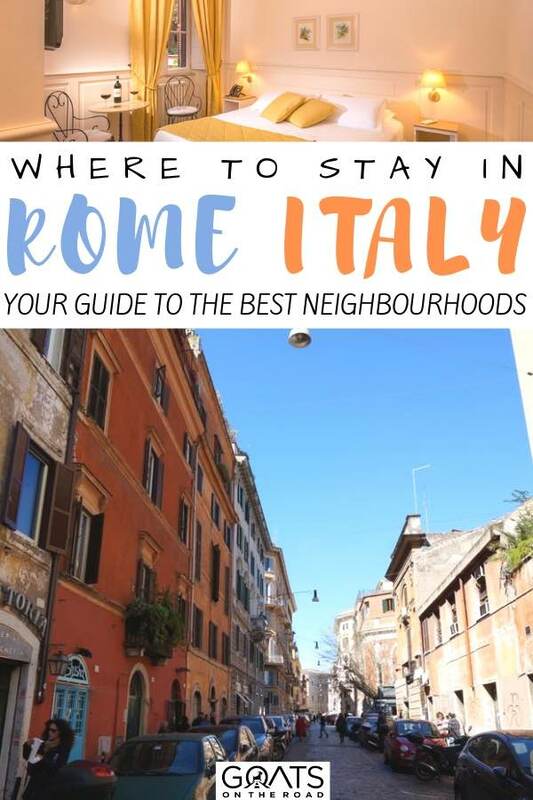 It’s also close to the city’s best wine bar, Vinaietto, the best pizza place, Emma’s and about a 10 minute walk to our favourite restaurant in Rome, Da Francesco. Every room is brightly painted, has natural light, large windows, an LCD TV and air conditioning. There’s also a very small breakfast included (a steal at this price), though it won’t blow your socks off. It’s basically toast, meats, cheeses and coffee, but it’s a good way to start the day. Rooms are small, but if you’re trying to figure out where to stay in Rome that’s within all the action, this is a good bet. Mama’s Home Rome: Although more expensive than the Spanish Suites above, with over 459 “wonderful” reviews on Booking.com, this is certainly one of Rome’s most recommended accommodation options. The hotel offers modern rooms and suites in Rome’s lively Campo de’ Fiori area. Free Wi-Fi is provided throughout the entire property. Each room includes a flat-screen satellite TV and a private bathroom with hairdryer. Some have wood-beamed ceilings. Mama’s Home is just 100 m from Corso Vittorio Emanuele main street. The famous Navona Square and Pantheon are both just a few minutes away by foot. 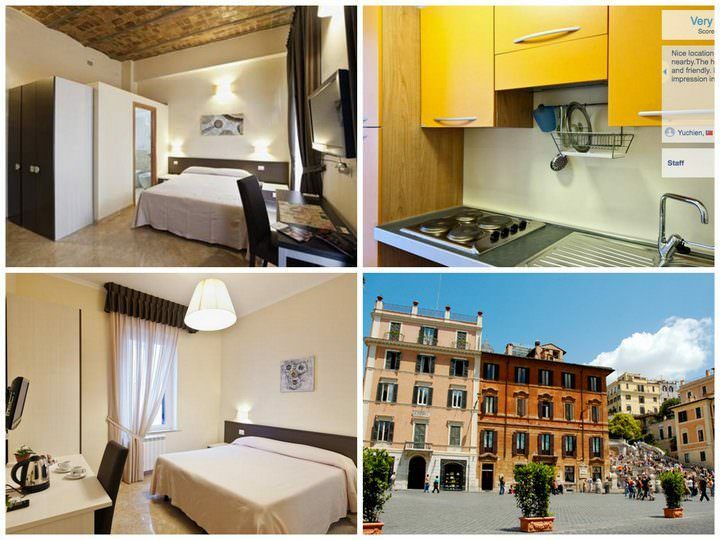 HiSuite Rome: Set right in the heart of Rome, HiSuiteROME is 5 minutes’ walk from both Piazza Navona and Castel Sant’Angelo. It offers ultra-modern apartments with free Wi-Fi and a Nespresso coffee machine. Each apartment is air-conditioned & features a 26″ LCD TV in both the bedroom and living room. There’s also a small kitchenette with Nespresso coffee machine and electric kettle in every suite so you can save money on food. Daily cleaning is included, plus HiSuiteROME has a bike rental service that can organise tours guides. The surrounding side streets are famous for their vintage stores and interesting boutiques. At this cost, HiSuite is one of the best value for money places to stay in Rome. Without a doubt this is Rome’s most charming neighbourhood. If you’re trying to decide where to stay in Rome and you don’t want to be right in the middle of the action, but not too far from all of the sights, then the quieter (but more expensive) Trastevere neighbourhood is the perfect place for you. The lower height of the buildings, the baroque architecture and the brilliant pastel colors make walking around Trastavere a highlight of a trip to Rome. Even if you don’t stay in this area, you should consider coming here at least once or twice during your visit, to walk around the narrow lanes and eat at one of the many boutique style eateries and wine bars. Piazza di Santa Maria: This is Trastevere’s, and one of Rome’s, most charming plazas. Piazza di Santa Maria is lined with lovely (although slightly overpriced) restaurants and it is centered around a beautifully ornate fountain. Music is often played in the plaza and it’s a perfect place to relax and enjoy an ice cream or lunch. The Narrow Streets: Give yourself an hour or two just to get lost in the historical labyrinth that makes up the Trastevere neighbourhood. Allow yourself to stop in at one (or two or three) of the many beautiful restaurants and wine bars. Second lunch you say? Why not?! Basilica di Santa Maria: Step inside its dimly lit interior and prepare to be amazed by the glittering Cavallini mosaics depicting the font of oil that spouted when Christ was born – according to myth, the church was founded on the very spot of that holy event. The accommodation in Trastevere is a little bit more expensive than other parts of Rome, but once you spend a little while walking around here, you’ll probably start to think that it’s worth every penny. When trying to decide where to stay in Rome, it’s a hard choice because each neighbourhood has its pros and cons. However, many travellers are starting to choose the Trastevere area. There aren’t really any hostels in the Trastevere neighbourhood, but there are a couple of good guest houses to choose from. Finestra Su Trastevere Guest House: Although not technically a hostel, this little guest house is one of the best-value options in Trastevere. 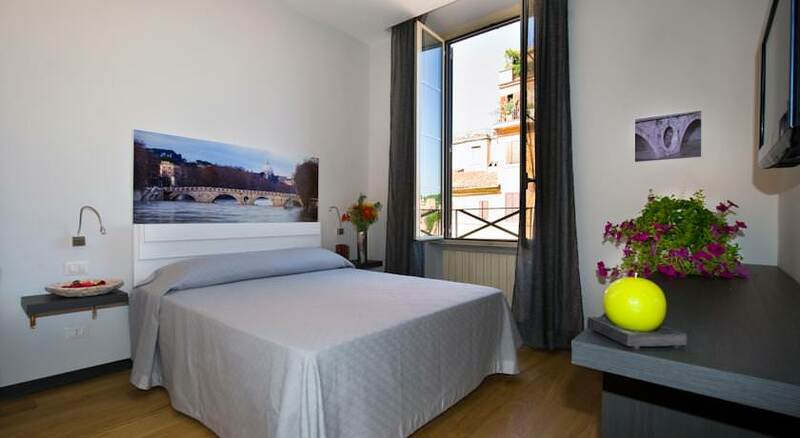 Finestra Su Trastevere offers modern accommodation with free Wi-Fi in the centre of Rome. The property has a terrace with views of Rome. With city views, the air-conditioned rooms feature a flat-screen TV. The private bathroom includes a shower. The guest house is a 15-minute walk from the Pantheon, while the Colosseum is 2 km away. It’s very close to all of the best sights in Trastevere (listed above). Hotel Domus Tiberina: The rooms here are small, but the hotel is an extremely good value given its excellent location. Overlooking one of the most picturesque squares in Trastevere, Hotel Domus Tiberina is next to one of Rome’s most ancient bell towers. The hotel is set in a former noble town-house of the 18th century and offers rustic, yet modern rooms with air conditioning. Free Wi-Fi is available in communal areas and some rooms. 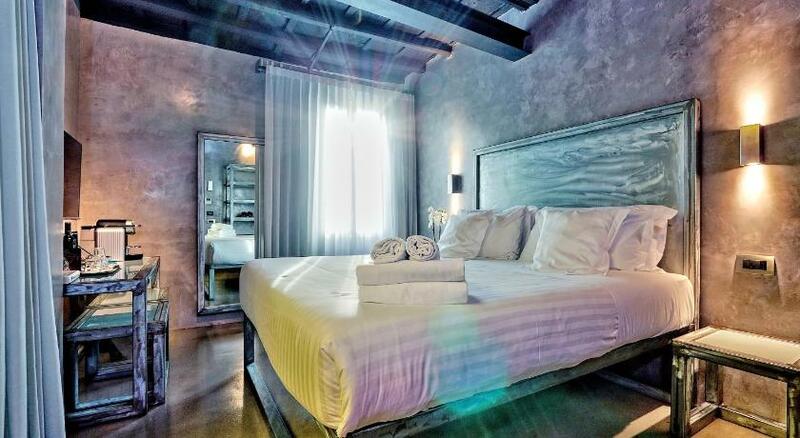 Rooms at the Domus include a flat-screen TV with satellite channels, and a private bathroom with shower. Some rooms come with charming wooden beams that are exposed on the ceiling, and some offer a balcony facing Tiberina Island. Guests receive free breakfast served at a choice of 2 cafés located nearby. An American breakfast can also be requested. 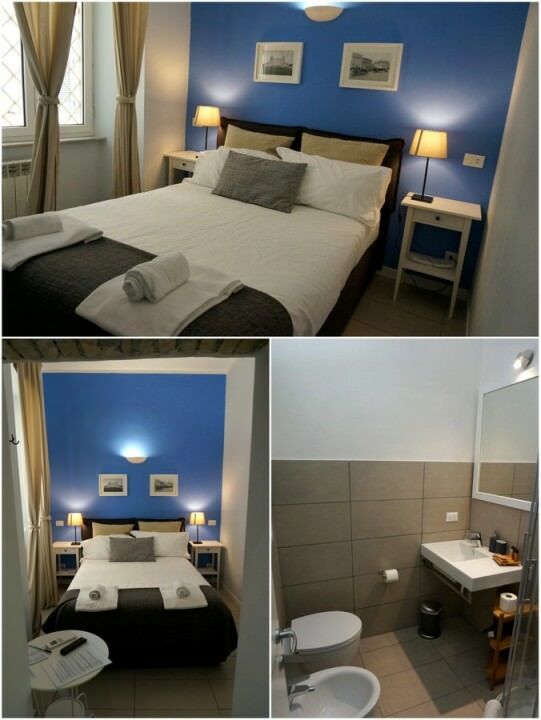 Home2Rome Trastavere: This place has some of the most beautifully decorated rooms in all of Rome and you really can’t go wrong with the price, especially considering every suite has a full kitchen, living room, dining area and LCD TV. Guests can taste local specialities and typical Italian food at the many cafes and restaurants in the immediate surroundings. Tram 8, with links to Piazza Venezia Square, stops 100 m from Home2Rome Trastevere. The Vatican City is a 25-minute bus ride away. Now You Know Where to Stay in Rome! 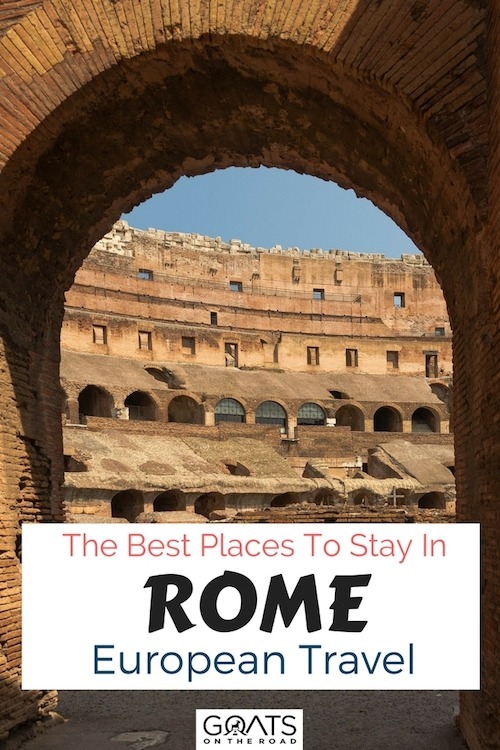 We’ve covered the top three best areas to stay in Rome so that you have a better idea of what this amazing city has to offer, and where you want to stay during your visit. If you’re looking for easy access to transport and lot of budget to midrange accommodation options, then the Roma Termini area is perfect for you. If you want to be right in the heart of the Eternal City, with a 15 minute walk (or less) to every single one of Rome’s major tourist attractions, then the Historic Center is where to stay in Rome. And if you want to be close to the action, but in a much quieter and more charming part of town, then the Trastavere neighbourhood is probably where you’ll want to base yourself. Regardless of where you choose to stay in Rome, you’re in one of the world’s most fascinating and romantic cities, so enjoy it. We recommend staying at least 4 nights in the city because there’s just so much to see and do! Get your walking shoes ready because you’ll probably spend 12 hours a day simply roaming around Rome. For all accommodation options available in Rome, click here to see the latest prices, reviews and options on Booking.com. Have you already been to Rome and you’re planning on returning? What’s your favourite area to stay in the Eternal City? Share with us in the comments below. Wow. Super handy post. I’ve stayed at the wonderful Rome Cavalieri – it’s not central but is practically a resort with great outdoor pools, and I’ve gone the other direction and stayed cheap at a hotel by the train station that I do not care to remember. Rome has it all. Rome definitely has it all! So many options for sleeping 🙂 We stayed near the train station and in Campo de’ Fiori. Looove Rome! Rome, one of our favorite cities as a family and because we LOVE to eat, one of our favorite places to be is in Trastevere. Great round-up of some nice accommodations around a beautiful town. Great options! I love Rome and we would love to come back again. This comprehensive list of neighborhoods and hotels is a good resource for people who haven’t travelled in Rome. Thank so much for commenting 🙂 We really hope people find it useful! Great tips. If only I had read this article before I get to Rome. I stayed in a nice hostel but I did not know about these variety of choices. These informative articles are so helpful for the travellers. We are planning another visit to Rome and as a couple this time. I think this article will be a good city guide about finding right hotels then. Thank you. 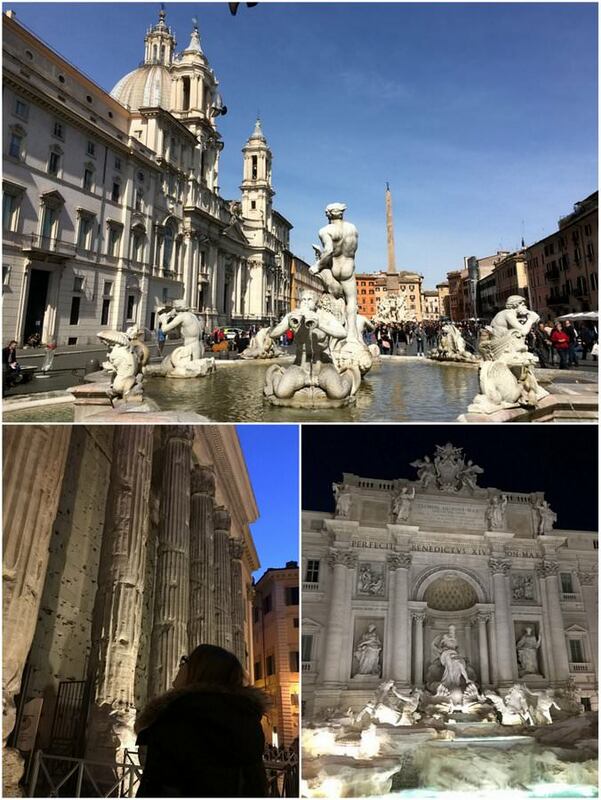 We stayed in the Historical Center in Rome as part of our honeymoon and loved the access and proximity to everything. We’d love to go back to Rome and spend more time. This post will come in handy for sure! I’d definitely look at the Trastevere area. The food scene looks and sounds amazing! I loved Rome, we stayed by Roma Termini. We loved it as we could explore the main sights by foot! Can’t wait to get back to Rome. Same here 🙂 Spent some time near the Termini as well, great location! It can easily get overwhelming trying to choose accommodations in a big city, so it’s great to come to a resource that is a trusted in the know resource! Thanks for breaking it down by area. I want to go!! What amazing recommendations. Will share! What a comprehensive guide! When in Rome recently, we stayed near Termini but I think next time we would head to Travetere (it’s just so stinking cute over there). Fortunately, Rome is easy to cover, so there aren’t many bad areas to be located – we loved it and got plenty of walking in as well! What a complete guide guys, I am sending it to a friend going to Rome in a couple of weeks! Thanks for sharing it around Mar! So many great suggestions–thanks so much for the detailed list! It’s always nice to have a breakdown by area. I will definitely have to save this for when we head to Rome someday. I’ve heard good things about The Beehive Hostel as well–it looks like a cute spot. I love the decor at Mama’s Home Rome, as well! Thanks Jenna 🙂 The Beehive was amazing! Loved the owners, staff, rooms, location and the amazing little on-site cafe! Great selection of accommodation in a variety of areas! I love that you can stay almost anywhere in Rome and everything is walking distance – and there is always yummy pasta on every corner! Oh how I love Rome! mmmm, pasta!! haha. Thanks for the comment Vicki! I don’t personally know anything about it. Is it this one: https://www.hotelscombined.com/Hotel/Terminal_Hotel_Rome.htm?a_aid=156677 ? Enjoy your stay in Rome, it’s amazing! Hi goats, another great post! Quick question – I don’t suppose you stayed at all these accommodations, so what criteria did you use to include them? Hey! Thanks guys 🙂 We stayed at 3 of them, and heard about the others from other travellers, or they were listed as recommended on booking engines. Have you been to Rome?! Pingback: Rome tourist attractions. What to see in Rome?